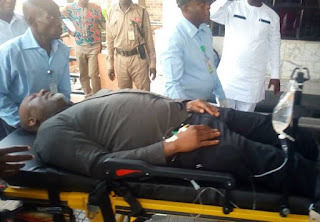 Dino Melaye, senator representing Kogi west, has just been admitted into Zankili Medical Center, Mabuchi, in the federal capital territory (FCT). He was said to have been brought into the hospital after sustaining injuries in a bid to escape. The hospital ambulance brought him at the hospital around 4:25pm, after which he was admitted into the emergency unit. There were no security operatives when he arrived. It was learnt that the senator was reportedly being led to court by the policemen on Tuesday afternoon when he attempted to escape. It was gathered that the police vehicle carrying Melaye turned to an unknown location, around Area 1, Abuja. Unconfirmed reports have it that they had manhandled him and had planned to take him to Kogi, his home state. Melaye was said to have immediately jumped out of the vehicle, sustaining injuries in the process. A man who followed the ambulance that conveyed the senator to the hospital said he witnessed the “drama” leading to the injury. Addressing journalists at the hospital, the man simply identified as Peter said: “I was there at Area 1 when the police vehicle stopped somewhere and amid the confusion, there were shouts of ‘shoot him, shoot him’. “He has been saying it that they want to take his life and we can see that now. Yesterday, about 200 policemen were in house. They were there till this morning. When he came out, he told them ‘okay, I’m going to go with you people to the police station.’ That he is not a criminal and that they don’t even have any arrest warrant on him. But he followed them. Melaye has been having a running battle with the police lately. Security operatives on Monday laid siege to his house after he was detained at the Nnamdi Azikiwe International Airport, Abuja, and prevented from travelling abroad. The police had earlier declared him wanted over allegations of supplying arms to crime suspects. The police are yet to release any official statement regarding the recent developments.